The state of the economy may be a little suspect, and political uncertainty abounds, but here in Ottawa nothing seems to hurt the real estate market. 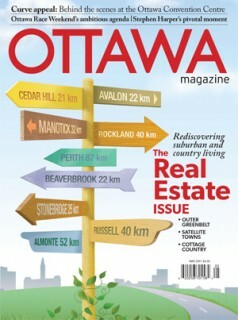 As prices continue to head up, up, and up, Ottawa Magazine’s experts decided this year to check out the price of real estate outside the city’s urban boundary. After looking at the options, many buyers have made two big leaps (beyond that first leap: the decision to buy). Some have chosen to hop over the Greenbelt and buy into communities on its outer edges. Others have decided to make an even bigger leap, looking to Ottawa’s satellite towns and precipitating mini building booms beyond city limits. Michael Prentice and Laura Byrne Paquet crunch the numbers to discover which communities and satellite towns are trending — and what you can expect to pay for a slice of suburban paradise. Commissioned to document the demolition of the much-maligned Ottawa Congress Centre and the construction of its dramatic replacement, photographer Willie McElligott stopped by the busy Ottawa Convention Centre construction site on an almost daily basis for more than two years. His tens of thousands of photographs show every step of the process — and paint for us a portrait of how this major project was realized. With the shiny new OCC wowing delegates from near and far, we take a closer look at some of the project’s key moments to understand what it takes to dream on this scale. COMING UP: Our annual “Best of Summer” previews the season’s hottest events, foods, and fashions; the popular outside guide offers up adventures and ideas for enjoying the great outdoors; and Giller Award-winning author Elizabeth Hay takes time out from her busy spring book promotion tour to pen a new piece exclusively for Ottawa Magazine.